St. Brendan was known as the Navigator. One-hundred years before Brendan was born, Ireland was moving from a pagan to a Christian nation. Although St. Patrick did much to convert Ireland, Christianity did not flourish after his death. Brendan carried on the mission to spread Christianity. In 484 A.D. Brendan was born in the small seaside village of Fenuit of western Ireland near the city of Tralee. 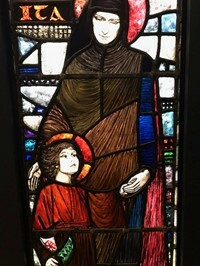 His parents, Finlug and Cara, were devout Catholics and Bishop Erc was their spiritual leader. It was Bishop Erc who baptized the child and changed his name from Mobhi to Brendan (sometimes spelled Brendon, meaning “white”). His name was changed because after his birth the entire region was covered with a heavy white mist or frost. Due to the many unusual events occurring at the time Brendan was born, Bishop Erc felt that Brendan was a special person in the sight of God. Since the custom of Christian families was to give their first-born and tenth son to the Church, Brendan spent his first year with his parents and then was taken to the convent school of St. Ita. During his five years at St. Ita, Brendan learned virtue, faith, generosity, love, and obedience. His many talents surfaced and revealed his special place with God. When Brendan reached the age of six, he returned to Artfert, a city near his home, to study under Bishop Erc.